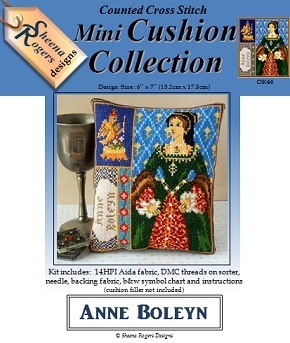 Stitch a slice of Tudor history with this mini cushion design of Anne Boleyn, Henry VIII's second wife. Anne Boleyn was Queen of England when she married King Henry VIII on 25th of January 1533 until her death by beheading in 1536. This triptych design features a portrait of Anne, set against a tapestry-style background, with a second panel of the badge of the Queen (being the crowned Falcon, standing on a tree stump surrounded by Tudor Roses) plus a third panel with her name and a mini Tudor Rose border. This mini cushion cross stitch kit includes: 14HPI white aida fabric, ready-sorted DMC Stranded Cotton Threads on a numbered card sorter, needle, backing fabric, b&w symbol chart and instructions (cushion filler not included). Design size: 6" x 7" (15.2cm x 17.8cm). Only whole cross stitch is required with backstitching needed for the finer details.